In much of his previous work, most notably Illywhacker and The True History of the Kelly Gang, Peter Carey has explored the psyche of Australia. 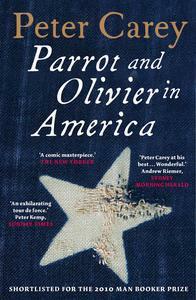 In Parrot and Olivier, he turns his gaze to America. Parrot (the nickname for John Larrit, son of a journeyman printer from Devon) and Olivier (Olivier-Jean-Baptiste de Clarel de Garmont, son of the Comte and Comtesse de Garmont) are thrown together as an unlikely pair on a tour of the new democracy of America. Parrot, through circumstances beyond his control, has fallen into the service of M. de Tilbert, a French aristocrat who has fallen on hard times. Parrot had ambitions of becoming an engraver, an artist, but his skills are at Tilbert’s beck and call. The Garmonts narrowly escaped the guillotine of the first republic, but Olivier’s mother, fearing the imminent ascendancy of the second, contrives to send him on a mission to America to examine the prison system there on behalf of the French Ministry of the Interior. She enlists the help of her old friend M. de Tlibert to provide a companion who can act as servant and minder for Olivier. And so this unlikely pair ventures into the new world of 1830s America. In parallel narratives they tell of their experiences and reactions to this young nation, its people and its form of government. America is the place where fortune awaits anyone who is prepared to work hard, where the lowliest may become the highest. For the aristocrat Garmont, such ideas are threatening; for Parrot, they challenge his notion of the master/servant relationship. As they journey on, Olivier becomes more and more seduced by the ideas of democracy, especially aided by his love for Amelia, the daughter of a Connecticut Yankee. Parrot, too, sees the opportunity for a new kind of life that does not include servitude. The relationship between the two changes. In the end, Olivier rejects notions of democracy, while Parrot embraces them. For Olivier, democracy ensures the ‘awful tyranny of the majority’; for Parrot it represents opportunity. In this marvellous book, Carey will no doubt antagonise and provoke some critics: firstly for his departure from an Australian theme and secondly for his unabashed admiration for the principles of the American democratic tradition. In spite (or because) of this, it is a grand, magisterial story, full of great characters and stories. Above all, it is one of his most important books and a major development in his writing career.